The Official Game Football of the NCAA. Designed for the serious competitor/professional. The top of the line leather game football designed for the highest level of competitive play, for the elite player – a great ball for the serious fan or collector. Patterned after NFL Game Ball. Lockstitch construction is a Wilson guarantee that each stitch is independent of the other, pulling a thread will not unravel the seam. 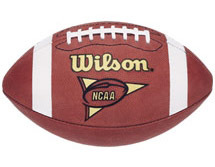 Wilson is the Official Football of the NCAA Football Championships – Division IAA, Division II, and Division III. Wilson footballs are used by 35 of 40 1999 bowl teams including the National Champion. The NFL pattern is used by professional teams and most Division I Programs. Over 80% of the Division I Programs are using the 1001 NCAA Game Ball. Since 1950, 45 of the 49 National Champions played with a Wilson football.